A firefighting plane drops a load of fire retardant over a smoldering hillside, Sept. 15, 2015, in Middletown, Calif. Some residents cried as they walked through the rubble of their homes while others shared amazing stories of survival as more people returned to their houses Tuesday and surveyed the twisted metal and smoking ruins left behind by a devastating California wildfire. Gary Herrin sobbed as he walked through what had been his childhood home in Middletown. "Yep, grew up here, was able to walk to school from here. Many friends lived close by," Herrin recalled, looking around. "There's a lot of good people here, but it's a ghost town now, it's really eerie." His brother had been living in the home and members of his extended family resided nearby. Gary Herrin angrily kicks at an old Chevrolet pickup truck destroyed in a wildfire several days earlier as he visits the family home for the first time since it burned down, Sept. 15, 2015, in Middletown, Calif.
"I go to my brother-in-law's house, my niece's house, and there's nothing, nothing, ashes," Herrin said. A number of people saw the devastation for the first time since the massive flames sped Saturday through rural Lake County, less than 100 miles north of San Francisco. 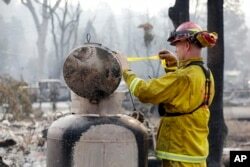 Aided by drought, it had consumed more than 105 square miles and was 30 percent contained Tuesday evening. Fire investigators working to determine what caused the massive blaze have narrowed their focus to an area in the community of Cobb, where the blaze was first spotted, said California Department of Forestry and Fire Protection spokesman Daniel Berlant. What sparked the blaze remains under investigation, he said. The charred remains of an apartment complex remain that burned from a wildfire two days earlier, Sept. 14, 2015, in Middletown, Calif. Authorities say 585 homes were known to be destroyed, and the number was expected to increase. Another 9,000 structures remained threatened. During his return, Herrin walked to the charred remains of an old Chevy pickup and gave it an angry kick. The truck was the only possession of his late father that he still had. Other people found nothing but concrete foundations and chimney stacks. "You've got to look at everybody's, everybody's loss," Herrin said. "It's never going to be about one person. It's about everybody." The Lake County fire and another blaze about 120 miles to the southeast have displaced 23,000 people and were the worst of a dozen wildfires burning in the state. The Lake County fire spread into northern Napa County, but the region's famous wine valley was not threatened. Rancher Lisa Comstock said she and her three dogs survived the raging fire in rural Middletown by jumping into a water trough as flames neared her home. Comstock was also able to keep her horses nearby as the fire burned around them. "The flames were coming over that mountain and surrounding this place like there was no tomorrow," she said. "I jumped in the water trough with all the dogs, and the horses came up around. Thank God they just stayed here." At one point she was sure she wasn't going to make it but talking to her animals helped keep her and the animals calm. "If this is how I go, I'm not leaving these animals. That's all I could think of," she said. Thousands of utility crew members and firefighters were working diligently to control the blaze and get life back to normal for as many people as possible, said California Department of Forestry and Fire Protection spokesman Dave Shaw. "We're working as hard as possible to try to put out the hotspots in these burned areas so that when people do come back there won't be a risk of them getting burned themselves," he said. Fire Capt. Roger Lutz tags a leaking gas tank in the remains of a home destroyed in a wildfire several days earlier, Sept. 15, 2015, in Middletown, Calif. The utility companies were trying to restore power to the area and water was flowing in some areas of town. One person has been confirmed dead, and others were unaccounted for, but authorities said they could be staying with relatives, on vacation or elsewhere and not impacted by the fire. The dead woman has been identified as Barbara McWilliams, 72. She told her caretaker she didn't want to leave her home near Middletown. The world traveler and sharp-minded woman with advanced multiple sclerosis said she would be fine. Her body was found Sunday in her burned-out home after flames kept Lake County sheriff's officials from reaching her. Scores of people in Lake County were escorted back to their homes Tuesday to check on pets and farm animals. They were allowed to remain for 15 minutes to feed and give water to the animals. Will Irons was headed to his surviving home in Hidden Valley with his two dogs that escaped the fire with him. He was anxious to see if his two cats, chickens and hamster were still alive. Lake County has been particularly hard-hit. In late July, a wildfire east of Clear Lake destroyed 43 homes as it spread across more than 100 square miles. Another fire erupted Aug. 9 several miles from the community of Lower Lake. Throughout the state, more than 6,400 structures remained threatened. East of Fresno, California's largest wildfire had moved away from the Sierra Nevada's Giant Sequoia trees, some of which are 3,000 years old.